Have you tried a spiralizer yet? It’s truly life changing. You can make so many delicious creations with veggie noodles. 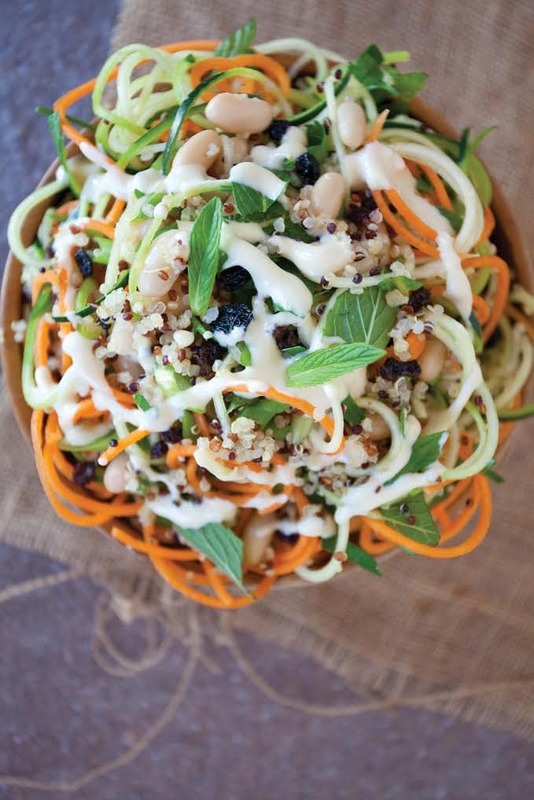 In fact, this recipe comes to you from the cookbook, Nourishing Noodles – Spiralize Nearly 100 Plant Based Recipes for Zoodles, Ribbons, and Vegetable Spirals. The book is written and photographed by Chris Anca of the blog, Tales of a Kitchen. Photo Credit: © 2016 text and photography by Chris Anca. First published in the United States of America in 2016 by Race Point Publishing, a member of Quarto Publishing Group USA Inc. This book has it all. Tips on spiralizing, breakfasts, appetizers, soups, raw entrees, and even desserts! All of them are beautifully photographed. Some of the other recipes I am looking forward to trying are: Quick Miso Noodle Soup, Cucumber and Sprouts Thai Noodle Salad, and the Coconut Cinnamon Carrot Cakes. For more info, or if you want to order the cookbook, click here. Delicious and healthy, this is sure to satisfy! Add the uncooked quinoa and water to a medium pot over medium heat and bring to a boil. Lower the heat and continue to simmer the quinoa, covered, until it absorbs the water. Turn off the heat. Place all dressing ingredients in a small bowl and whisk until creamy. Place noodle ingredients in a large bowl, add the dressing, and toss until thoroughly coated. First published in the United States of America in 2016 by Race Point Publishing, a member of Quarto Publishing Group USA Inc. Recipe and photo used with permission.